G class MTB 466, 29th Flotilla. National Archives of Canada, PA-144537. The MTB is a small, fast attack ship, designed to operate in shallow waters. The G Type is 21.6 m-long and can reach 41 knots. The D Type has a length of 33.5 m and a maximum speed of 30 knots. They are equipped with a 6-pound (2.7 kg) pom-pom gun and small-calibre automatic weapons. As their name reveal, they are armed with torpedoes, although those may be replaced by depth charges. The Royal Canadian Navy (RCN) created two MTB flotillas in 1944 to operate in the English Channel. 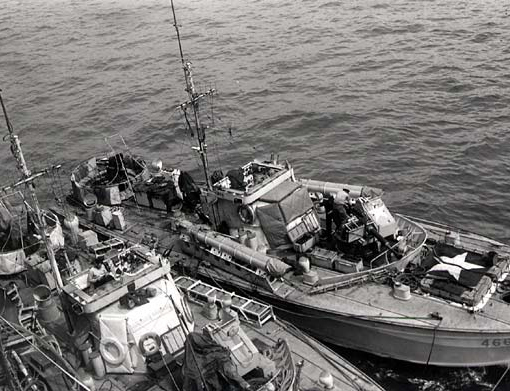 The 29th Flotilla used G-Type MTBs and the 65th, D-Types. These ships operated mostly at night, intercepting German convoys, and fighting their enemy counterpart, the E-boats. On D-Day, the two Canadian flotillas protected the flanks of the landing beaches and attempted to block enemy harbours.